I started ballet when I was 5 years old,and to this very day, I am amazed that I had the capability to know what I wanted to pursue as a career, at such an undeveloped age. I truly believe that I was put on this earth to dance. I naturally craved connection, and was drawn to things that created comfort and familiarity within my being: dance nourished my soul in that aspect. I was raised in Lawrenceville, Georgia (Just Northeast of Atlanta). When I was 5, I told my parents that I wanted to dance, so they brought me to Lawrenceville School Of Ballet, where I then began lessons once a week.Each year, my love grew vastly for performing in annual recitals and shows. At age 9, I started jazz and immediately took to the grounded movement and subtle, fierce, prowling feeling.Ballet eventually lead to pointe shoes, which lead to jazz, which lead to modern, which lead to hip hop, which lead to tap. The trickling effect that one genre had on the other, lead me to become a well rounded dancer, capable of most any task or challenge that was put against me. I was not a brainiac in school. I constantly felt stupid, because no matter how hard I studied, I could not understand the material being fed to me. My academics were becoming a lost cause, because if I wasn’t interested in what was happening in the classroom, I would completely dissipate into my own little world and daydream and scribble out all of the creative ideas that were flooding my brain. Going to dance everyday made me realize I did not have to earn straight A’s in school to be smart. I was bright in my own sense; learning choreography, remembering corrections from instructors, working hard physically outside of the studio, all proved that I was an intelligent, budding artist. In this current moment of my life, I have struggled with being a perfectionist; it has damaged me in some sense, and I have had to come to the conclusion that I can’t be good at everything. I can give my best effort and still fail. With some challenges in life, eventually you will come to terms with whatever it is, and raise the white flag. You learn, you experience, you get past it and move on to what’s around the corner. You cannot continuously beat yourself up over something that you struggle with, because it will eat you alive.I have struggled to take my own advice and apply this everyday while at dance, and I have to keep telling myself that things can only go up from here. The vast majority of my life, I had my sights set on pursuing professional classical ballet. That was what I wanted 100%, no doubts about it. I loved ballet, and I have the utmost respect for it, because it is DIFFICULT, but there was always an underlying feeling inside of me that never had enough. I felt like a lion trapped in a cage, with no voice, wanting to burst out and roar. In 2016, I auditioned for and was accepted to the Richmond Ballet trainee program and summer intensive. I graduated highschool, and immediately jumped into the pursuit. Since joining the program, I have been given nothing but stellar opportunities, constructive criticism, heart felt guidance by my superiors, and have made friendships and connections that will last a lifetime. 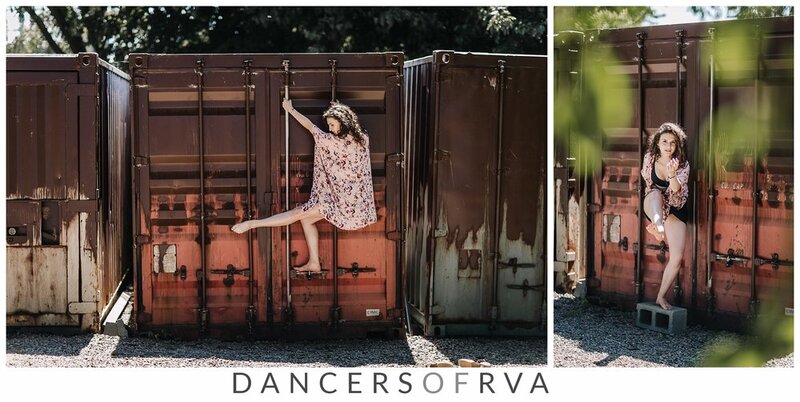 The staff and faculty at Richmond Ballet are truly divine individuals, and have helped to sculpt me into an improved dancer, and overall, person. Even amongst all of the technique classes, and rehearsals on the daily, there was still a fire inside of me when it came to other forms of dance. Although I have had many internal struggles throughout my time here,This program has truly been a meaningful stepping stone for me. It has sculpted me into a well rounded performer. My strong ballet technique gives me the upper hand at auditions, because I can do anything I am asked of, whether its jazz,modern,hip hop, you name it, ballet has given me the strength and smarts to pick up combinations quickly and physically endure choreography like its no problem. At this point and time in my life, I have come to realize, I do not want to pursue professional ballet. I discovered singing along side my dancing, as well as acting, and I need to have individuality on stage .Although corps work is very important, and quite fun, I have become burnt out, and am ready to venture out and broaden my horizons in other projects and forms of dance. I believe I have wanted to pursue jazz/theatre dance for most of my life, but I suppressed those feelings to see how far I could get with ballet. After this audition season, I have been getting so many No’s from ballet companies…almost as if it were a sign from the universe. My head and heart are just not in the same place, and it has come time for them to connect and make things happen. The city of Richmond has been a good home to me for about 2 years now. Who knows where I’ll end up next, but I am so excited for what the future holds for me. To all those dancers out there pursuing this career, remember: THERE IS NO ONE PATH. You must create your own path, tell your own story, make your own mistakes, and learn your own lessons. You are an individual, with a heart, a soul, a brain, and you must fight for what you want. Allow others to help you, influence you (positively), inspire you, support you. Strive to be a well rounded dancer, it will benefit you in the long run. Self-care is more important than people realize, and you have to feed your soul with healthy things that will water you and help you blossom into the beautiful being you were meant to become. It will take a good amount of time to find your place and where you belong, but once you have reached the point of realization and confidence, it is SO rewarding. I am proud to announce that I will be performing in West Side Story with the Virginia Rep Theatre this summer, and I have never been more grateful and excited about any opportunity like this in my existence. This is just the beginning of my career, and I just know there are so many other things in store for me in my life. I chose the T. Tyler Potterfield Memorial Bridge/Canal walk for my shoot location because I feel a special connection with it, on many levels. There are many days where I feel out of touch with reality, and going to the bridge helps me to refocus. Being near the river has a calming and humbling affect on me; it makes me realize how blessed I am. I often take life for granted, especially when it comes to my health and well being. Hearing the river, seeing the sunset, and walking along the bridge is a privilege and freedom that I have that I am so very thankful for. The view of the Richmond skyline is a picture perfect representation of the city that helped build who I have grown to be. Bracelet by Mudlove in support of Water For Good!